You can view and download each presentation by clicking on its title below. FSB will have two presenters: Fred Schmidt, FAIA, and Jack Morgan, AIA, whose presentation is titled “Removing Academic Learning Silos”. FSB’s project discussion will focus on Oklahoma State University’s College of Engineering Architecture and Technology (CEAT) new Undergraduate Laboratory. This unique project has pushed facilities, designers, and professors to rethink both the pedagogy and definition of learning spaces. It has met the challenges of working with OSU’s campus environment of infrastructure and aesthetics. FSB Principal, Fred Schmidt spoke to Oklahoma teachers at Francis Tuttle for an Oklahoma Education and Industry Partnership (OEIP) event to discuss what FSB is looking for in future employees. “It all starts with you. 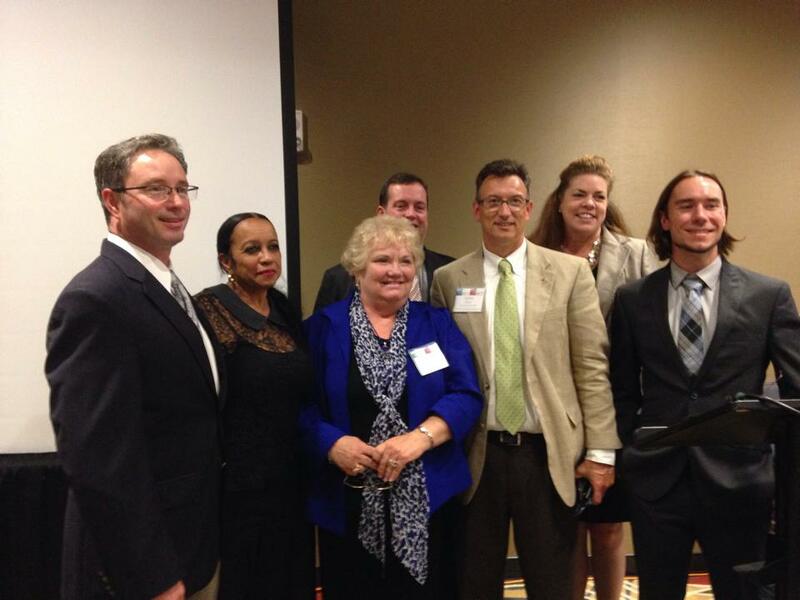 YOU instill and inspire students to become tomorrow’s best architects and engineers.” said Schmidt. OEIP hosts a training program for STEM teachers that include participation from other companies such as GE Energy, OSBI, Hobby Lobby, Chesapeake Energy & Integris Hospital. Wednesday, October 28th @ 8:00 a.m.
EDspaces features a CEU-accredited education conference that focuses on forward-thinking, sustainable design and the changing impact of environments on learning. With a variety of session topics and styles, the EDspaces education conference has something for everyone. All attendees are welcome to the Keynote General Sessions, as industry luminaries present visions of the future of educational facilities and learning styles. These can’t-miss sessions will set the stage for the day’s education program to follow. 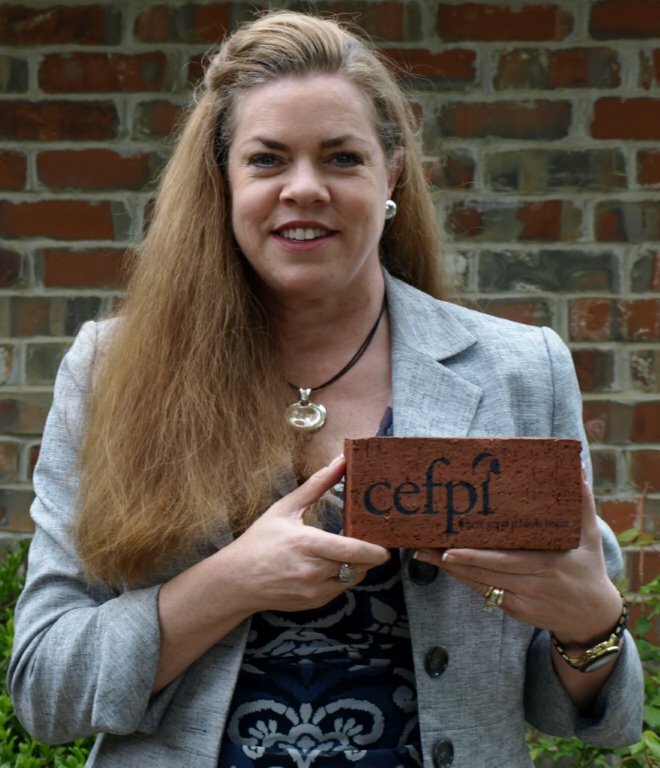 Education Design Studio congratulates Christina J. Hoehn, recipient of the 2015 CEFPI Regional Cornerstone Award. Christina is a Project Manager for the Education Design Studio and currently serves as the Oklahoma State President for the CEFPI Southern Region. Council of Educational Facility Planners International (CEFPI) is a professional non-profit association whose sole mission is to improve the places where children learn. They are the primary advocate and resource for effective educational facilities and serve those who use, plan, design, construct, maintain, equip and operate educational facilities. The Cornerstone Award is given to a Regional Member who has shown dedication and commitment to the growth and overall success of the Region. A recipient can only receive this award once in their lifetime. The CEFPI Southern Region covers Oklahoma, Texas, Arkansas and Louisiana and is the second largest region worldwide. 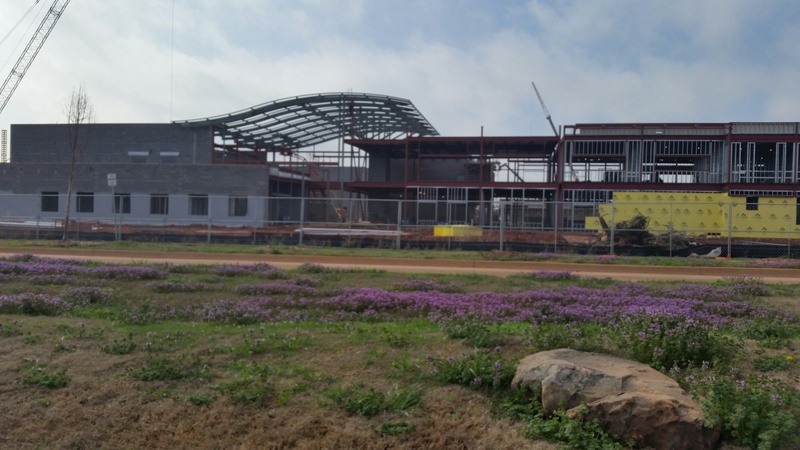 Heartland Middle School is taking shape as the curved steel is set into place. The 150,000 SF project will house students from 6 to 8th grades in the ever growing Edmond School District. Construction is also under way for the athletic fields to the east of the building that incorporate, softball, baseball, running track and tennis courts. This facility will be an great opportunity for middle school students and we anticipate their excitement in being part of new waves of change in education and educational facilities. Join us in Portland for CEFPI’s Annual Conference and Expo, BLAZING TRAILS and a Journey of Learning. Together we will explore new ways to ensure that all students have healthy, safe, resilient, and sustainable 21st century learning environments, providing real-world learning experiences and opportunities for creativity, critical problem solving and collaboration. During our conference we will discuss unique kinds of spaces needed to develop these skills, where students are enabled, engaged, and empowered to succeed in today’s global economy, strengthening the communities they serve. CEFPI is where great schools begin…and it is you, our members, who will plan and design the 21st century learning environments for the next generation of learners! We look forward to seeing you in Portland to lend your voice in this Journey of Learning as together we blaze trails for a brilliant future! This session will explore trade-offs encountered when design professionals structurally harden schools to ensure student safety. This session will include a discussion lead by the research team as well as information gathering from design professionals about their experiences designing schools for safety. Learn how parents, community members, teachers, administrators, architects, engineers and others would benefit from research and design tools that illustrate and support modeling of healthy school environments. Gain an understanding of trade-offs between structural hardening, sustainability, and environmental quality. Understand how these tools are critical in times when decision makers are influenced by tragic events and lose perspective on ways in which reactive decisions might affect student and teacher performance. C3, one of 22 centers funded by the U.S. Department of Education to support the improvement of educational outcomes, held an Advisory Board meeting in St. Louis this month. 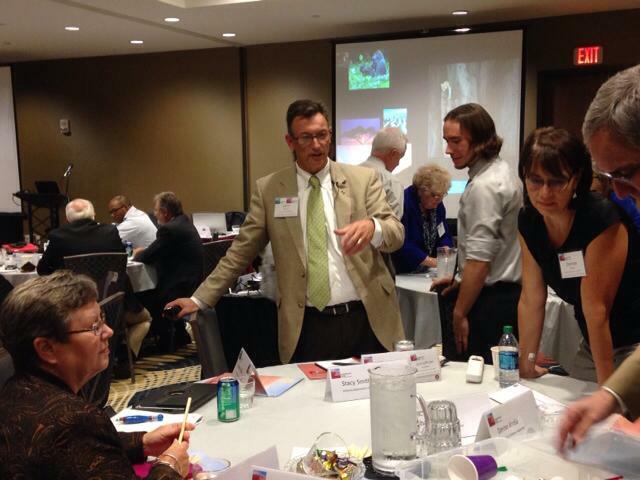 FSB and HMA presented a collaborative presentation on “School Design for the Future”. Here is a link to the Central Comprehensive Center at the University of Oklahoma web page. 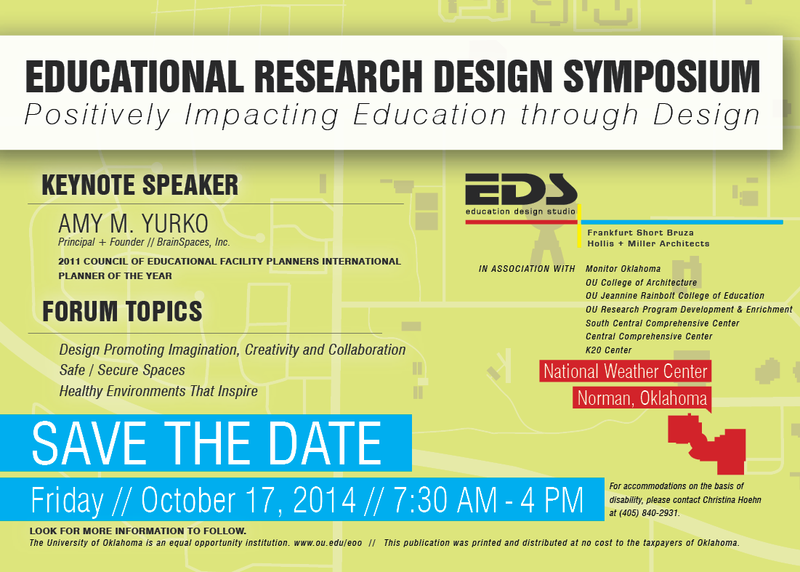 The Educational Research Design Symposium will be held on Friday, October 17th from 7:30am-4pm at the National Weather Center in Norman, Oklahoma. Forum Topics, led by keynote speaker Amy M. Yurko, will include Design Promoting Imagination, Creativity and Collaboration, Safe / Secure Spaces, and Healthy Environments that Inspire. The event is hosted by Education Design Studio, an education planning and design collaboration between Frankfurt Short Bruza Associates, P.C. and Hollis + Miller Architects.